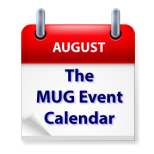 This week’s MUG Event Calendar may still show many groups on summer vacation, but there are still plenty of events of note. A Michigan group will celebrate thirty one years with virtual visits by Adam Engst of TidBITS, Joe Kissell of Take Control Books, and Chuck Joiner of MacVoices. A group in Oregon will look at ergonomics, and a California group will focus on the capabilities of Apple’s Messages program.